For the record, I didn’t sell City Weekly, as was announced on April Fools’ Day a couple weeks ago. It was a prank. Just Monday, April 12, I was still being asked if the story were true, so it remains tempting to keep our little Frankenstein alive. But, that’s not to be. It’s over. Cut the power. 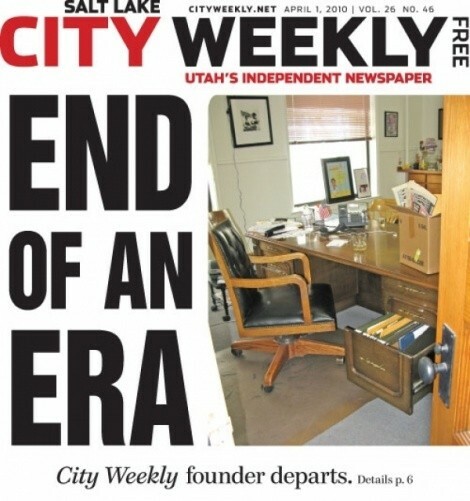 City Weekly is not owned by the LDS Church—not that they wouldn’t want us. Tip off: Next year, we buy Singleton. Anyone who knows a whit about alternative newsweeklies knows that many of them play the occasional prank. Until now, outside smallish blurbs, we’ve resisted the urge to join in the fun of pranks like those created by Phoenix New Times, such as having a fishing contest in a dead lake or telling readers that the newspaper’s ink contained a nonaddictive drug that combined all the best elements of cocaine, heroin and marijuana. Readers all over Phoenix rolled up New Times and ate the paper. They bought fishing gear, too. We knew the premise that I was selling the paper was an old one; a tired old one, at that. But, pranks work on several levels—plausibility measured against impossibility, plus timing. We couldn’t have done this a year ago. But recent events, like the LDS Church buying up large swaths of Salt Lake City, the fact that it is seen as being protective of its own while silencing its critics, and all the bad news about the daily newspaper industry, created the perfect prank storm. Perfect is a bit of an exaggeration, but it was damned-near perfect, and prepublication announcements on Twitter (follow @CityWeekly) and Facebook (become a fan) regarding suspicious events in our hallways set it up like rib jabs before the left hook. If we intended to punk anyone, it was not the readers. We were casting for larger fish and, by certain reports, we danged near got them. Hundreds of phone calls, e-mails and texts don’t lie. ABC 4 called it the prank of the year, giving about the only reporter not to fall for it, Chris Vanocur, his dream come true—a chance to sit in my office chair. Other gullible reporters also called. One local blogger (who will deny falling for it) left me a message asking for more information about the sale. He later posted on Twitter that our prank was lame compared to where he used to work—back when fax machines and pagers were considered high tech—and also tweeted that the best April Fools’ joke of all would be if I were to ever write something original. You won’t laugh when Jim Rizzi signs your checks, Warchol. We flat-out underestimated readers’ sentiment. Tears were commonplace. Two former employees called from out of state completely distraught. Another, who grew up in tough South Philly, melted at the news. It was difficult talking to them, as I had to basically console each one. A great number of readers were equally shocked. Some cried. Some laughed it off. Some thought it hilarious. Some said they’d never read us again. Some were angry. Some were bitter—like the ones who really do wish it were true that I had gone away. I had to laugh at one online speculator who referred to my huge Greek ego, this bully pulpit and my drinking in San Francisco’s Tenderloin District (I’ve never been there)—he believes I am an all-around journalistic wannabee. Good for him. For that person, I’ll hold on to City Weekly for another 26 years. The takeaway is that our readers—even Mr. Bitter Pill—have a sense of ownership of City Weekly that runs deeper than we knew. We’re grateful to learn that, despite the circumstances of how we found out. We love Salt Lake City. We love you. And we’re going to keep on being who we are—because, dammit, it’s fun and it’s serious and it’s ever more fun. That’s the City Weekly way.